In the building and construction sector worldwide there has been an emerging awareness of the term “resilience”. Resilient buildings are a must – especially in areas that are prone to extreme environmental events such as cyclones. When combined with an advanced construction method such as the FRAMECAD System, LGS can solve many of the challenges surrounding construction in areas susceptible to high winds and cyclonic activity. This was particularly evident for Component Homes in rural Western Australia, which uses the FRAMECAD system to design and build residential housing that are engineered to survive cyclonic conditions and can withstand winds up to 310kph (190 mph). “The FRAMECAD team worked with us to resolve engineering issues that are unique to Western Australia,” says Mike Huston, General Manager for Component Homes. 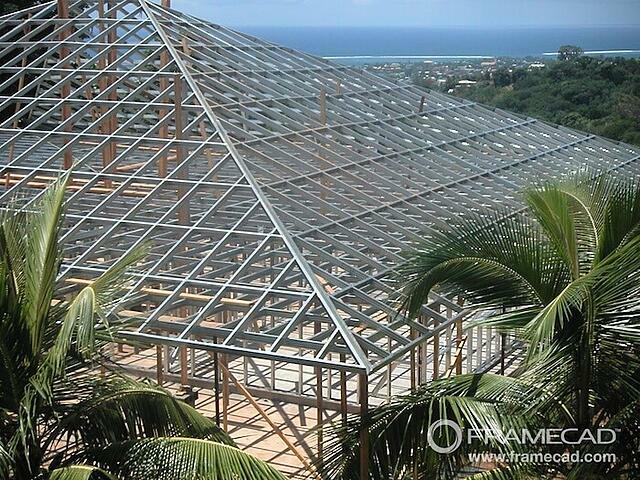 LGS framing materials are ideal for areas that are exposed to high-wind, cyclonic and coastal conditions. It’s high strength to weight ratio means LGS has capacity to withstand extremely high wind loads; loads that traditional materials would often not be able to resist. LGS framing can absorb lateral movement, which means in a high wind event, frames will flex without warping, twisting or breaking. Also, LGS is galvanised, protecting frames from corrosion – essential to cyclone prone areas that are repeatedly subject to high winds and rain. And as steel is inorganic, frames will not support insects such as termites or wood-boring beetles. All of this results in safer and highly sustainable building structures which will significantly outlast traditional materials. In many instances of disaster relief construction, local infrastructure has been knocked out completely. But with FRAMECAD’s Mobile Factory, reliance on external power sources and infrastructure is unnecessary. The FRAMECAD Mobile Factory is a completely secure, self-contained LGS frame production facility housed in a modified 40ft-shipping container. It’s on-site, compact nature, means it can be immediately shipped, trucked or airlifted into any location and made operational within 24-hours of delivery. And because it comes with its own diesel generator, the Mobile Factory is not reliant on external power. The FRAMECAD Mobile Factory has proven fundamental in humanitarian construction efforts, which are often carried out in areas affected by cyclones and have little in the way of local resources, tools or even power. FRAMECAD’s Mobile Factory has been employed to assist in disaster relief efforts after the 2010 Indonesian tsunami and the 2013 Philippines typhoon, amongst others. The performance of a building during a high wind event starts with strong design. With the FRAMECAD System’s unique design led process, wind load is specified at the start of the design and engineering process. Therefore steel structures are designed to respond to higher wind load utilizing heavier connections. The resulting structure will be guaranteed to withstand the specified force. The FRAMECAD System has the ability to adapt to the local building codes, cyclone building standards and practices of any area. The FRAMECAD System offers a resilient method of construction enabling communities to rebuild in cyclonic areas better, faster and safer. You can read more about how LGS and the FRAMECAD System helped construction companies and goverment agencies working in extreme environments here. Have a commercial or industrial construction project that requires the strength and ductility of an LGS framing solution? Talk to a FRAMECAD expert today.